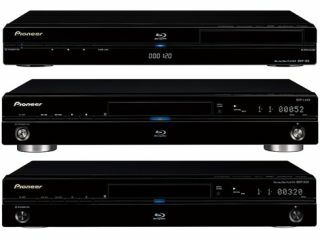 Pioneer today announced the arrival of three new Blu-ray players to the UK market. All of the machines are BD-Live, with the BDP-LX52 aiming for the luxury end of the market, the BDP-320 setting its sights on the mid-range and the BDP-120 readying itself for the entry level. Both the BDP-320 and BDP-LX52 support a Kuro Link Video Adjust System, which automatically adjusts the preset settings of the player depending on the type of Pioneer display connected. They also squeeze out uncompressed LPCM audio over HDMI, so your movies should sound as clear as can be. Audio-wise, the entry level BDP-120 supports Dolby TrueHD and DTS-HD Master Audio Essential and boasts a quick start of just 0.8 seconds – super speedy compared to other Blu-ray players on the market. While all players support BD-Live, an additional flash drive is needed to plug into the BD-120, which comes with the machine. The Pioneer BDP-320 Blu-ray Disc player will be available from June 2009, followed by the BDP-LX52 and BDP-120 in July. Prices for the machines are as follows: £549.99, for the LX52; £399.99, for the 320; and £269.99, for the 120.